(Bloomberg) -- Angola’s Eurobonds surged after the OPEC member said it asked the International Monetary Fund for financial support. Yields on the southern African nation’s $1.5 billion of bonds maturing in November 2025 fell 27 basis points, the most in almost two years, to 7.51 percent by 1:25 p.m. in London. The Ministry of Finance announced late Monday that it had called for the IMF to add a “financing component” to its support program, which initially was only going to include technical assistance. While the government said it needed help because growth was slower than expected and it was struggling to fund its budget amid falling oil production, investors had hoped it would turn to the Washington-based lender to speed up economic reforms. The expectation of an IMF program has helped Angola weather the sell-off in emerging markets over the past few months better than its peers. 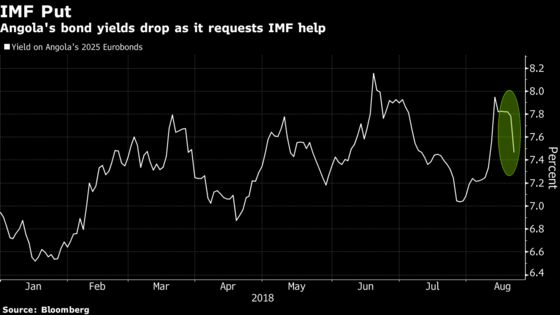 Its Eurobonds have made losses of 1.2 percent this year, which is less than the emerging-market average of 4.9 percent, according to Bloomberg indexes. Angola invited an IMF team to visit in October to start talks on a two-year Extended Fund Facility, which could be stretched to another year, the Ministry of Finance said. “Angola’s appeal for financial support from the IMF should help it adjust to lower oil revenue and mitigate the risk of reduced access to financial markets,” said Mark Bohlund, an analyst at Bloomberg Economics in London. If it strikes a deal, the country will probably receive more than the $1.4 billion it got from the IMF under a previous loan program that ran from 2009 to 2012, he said. The third-biggest economy in sub-Saharan Africa was battered by the 2014 crash in the price of oil, which accounts for almost all the government’s export earnings. President Joao Lourenco, who came to power in September, has tried to revive growth by tackling corruption at state firms and improving the business environment. The central bank has also devalued its currency, the kwanza, almost 40 percent against the dollar this year in a bid to end crippling shortages of foreign exchange. A recent drop in crude extraction has heaped pressure on the economy. 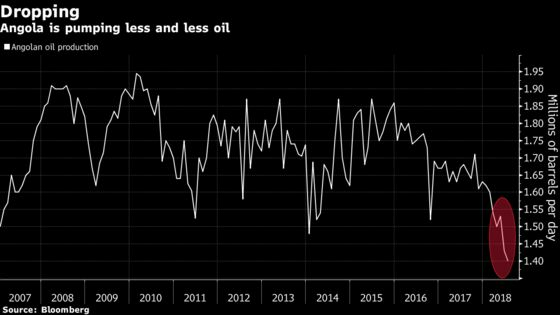 Angola pumped 1.4 million barrels a day in July, the smallest amount since at least 2007, according to data compiled by Bloomberg.